Does senior fitness really matter? Surely by the time you start collecting your pension, the last thing you need is to be working out? That was certainly the view in the past – there was a general belief that rapid deterioration of the body was an inevitable part of growing older, and that people should just kick back and accept it. These days, however, it is not uncommon for seniors to run marathons, compete in long distance triathlons, or take on challenges like hiking the Appalachian Trial. 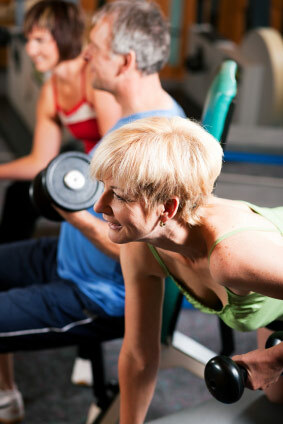 Are these people genetic freaks, or is it normal for seniors to be fit, healthy, and active? Fortunately this is a growing area for researchers, and the evidence they are uncovering is incontrovertible – not only can exercise slow down the symptoms of aging, it can actually reverse them. Indeed, many of the symptoms we normally associate with aging are simply the result of modern, sedentary lifestyles. Now you may be thinking, big deal, I don’t want to enter the Mr. Universe competition – but muscle mass isn’t about having big muscles, it is about mobility and independence, being able to easily do the things you have always taken for granted, everyday things like carrying heavy groceries or climbing stairs. What they found was that the slower people walked, the higher their mortality risk from illnesses such as cardiovascular disease. Watch any senior move and it is clear that flexibility decreases rapidly with age. This makes simple tasks more difficult, whether it is cutting your toenails or reaching up to a high shelf! The problem is clear, but what about the solution? Fortunately, it’s never too late to get back in shape. Researchers working in nursing homes have found that with regular exercise, patients as old as 98 can make dramatic improvements in strength, endurance, flexibility and balance! • Mortality and Heart Health: According to a study that followed a group of men and women for more than 40 years4, people age 50 and older who engage in regular physical activity live longer and have less heart disease. • Overall health: The National Institutes of Health (NIH) report that moderate exercise and physical activity improves the health of seniors who are frail, or who have diseases that accompany aging. • Brain function: Researchers have found that fitter seniors had higher scores on tasks like coordination, scheduling, planning, and memory. • Vigorous aerobic exercise for a minimum of 20 minutes three times per week. They suggest that you should perform at least 8 – 10 exercises that work your major muscle groups. Activities that maintain or increase flexibility should be performed for at least ten minutes, twice per week. This can include stretching, or activities like yoga or Pilates. Seniors should regularly perform exercises that maintain or improve balance – again, yoga is an excellent choice. Alternatively, do some research online – you’ll find lots of balance exercises demonstrated. With senior fitness so clearly crucial for maintaining good health and independence, regular exercise should be a part of every senior’s life.